Who Could Oppose an Ethics Commission? To New Mexico’s left-leaning advocates for “good government,” it’s all so easy. More laws. Tighter regulations. “Public” financing of candidates. Paid, full-time legislators. Implement Ralph Nader’s preferred policy architecture for politics and elections, we are told, and corruption will fade, citizen activism will expand, voter turnout will balloon, and “public service” will again be — and be considered — a noble calling. 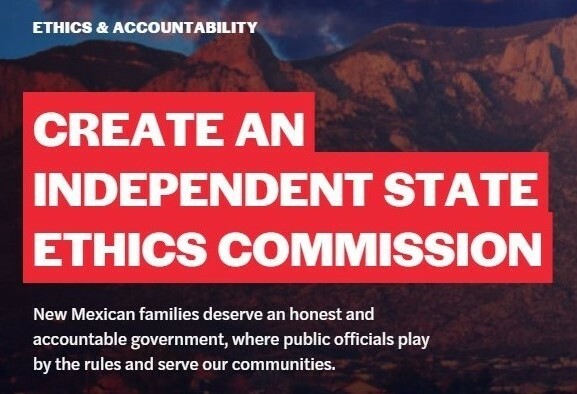 So it’s hardly surprising that on Election Day 2018, the usual suspects want voters to approve Constitutional Amendment 2, and thus create “an independent State Ethics Commission with jurisdiction to investigate, adjudicate and issue advisory opinions concerning civil violations of laws governing ethics, standards of conduct and reporting requirements as provided by law.” The League of Women Voters of New Mexico, Common Cause New Mexico, Bob Perls, liberal columnists — the couch-fainters want a “government that works for everyone,” and with that crowd, intentions are always more important than facts. And just because a bureaucracy has the word “ethics” in its name, does that make it unquestionably fair and impartial? Veteran journalist Jon Margolis recently criticized the Vermont State Ethics Commission for being “politically played” by a far-left group looking to hurt the incumbent (Republican) governor’s reelection chances. Last month, the Institute for Justice sued the Oklahoma Ethics Commission for blocking the public-interest law firm from distributing Bottleneckers: Gaming the Government for Power and Private Profit — “a $15 book” — to state legislators. No one would argue that New Mexico is America’s ground zero for honest pols, hard-working bureaucrats, and honorable government contractors. But voter skepticism is entirely reasonable when it comes to the “need” for yet another bureaucracy tasked with policing the “public good.” The best solution for secrecy, selfishness, and shadiness at the state and local levels in the Land of Enchantment remains less government, not more.